Last Wednesday was the first CSA pick-up for the year. 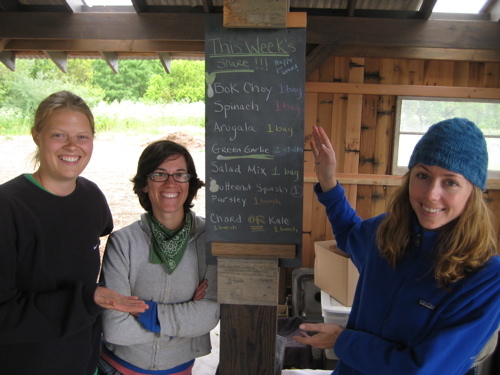 We rolled out our new farm-stand pick up layout in the barn on the farm, and it was a success! As you can see on the chalk-board, the shares are very GREEN for these first couple weeks. A cool, rainy spring (almost summer now!) has meant more greens for us to enjoy. And really, we ought to feel lucky, because they’re jam packed with nutrients and antioxidants and–speaking for myself–they make me feel so fresh and energized when I eat them. Arugula (Astro) — 6 oz. Spring Mix — 6 oz. Hello! I just discovered your blog from your website, and boy oh boy, does it ever make me yearn to move right next door! I live in the Dallas, Tx area and have been talking about moving to CA to live the ‘real’ life…where the people seem to get it…living life the way it was meant to be. It is so wonderful to read about your experiences and to know that there real people behind the produce we see at the farmers’ markets or even, the grocery store. Blessings to you for all your hard work and don’t ever stop!